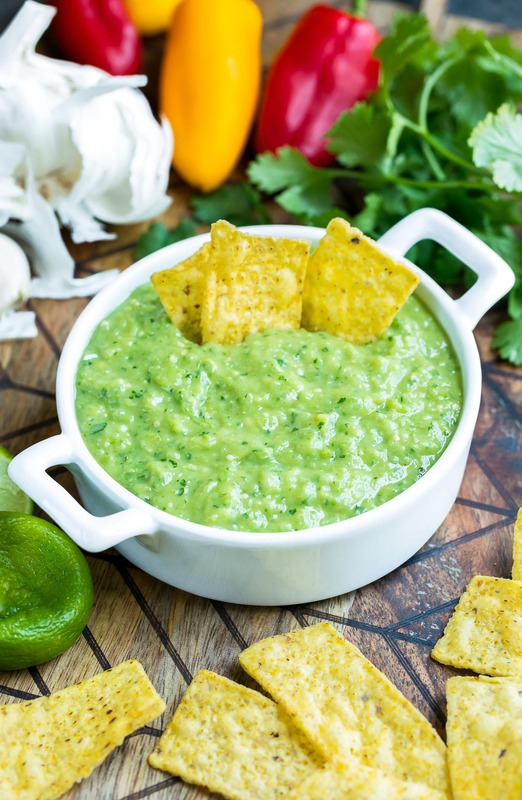 This Avocado Salsa Verde can be made in your blender in just 10 minutes! 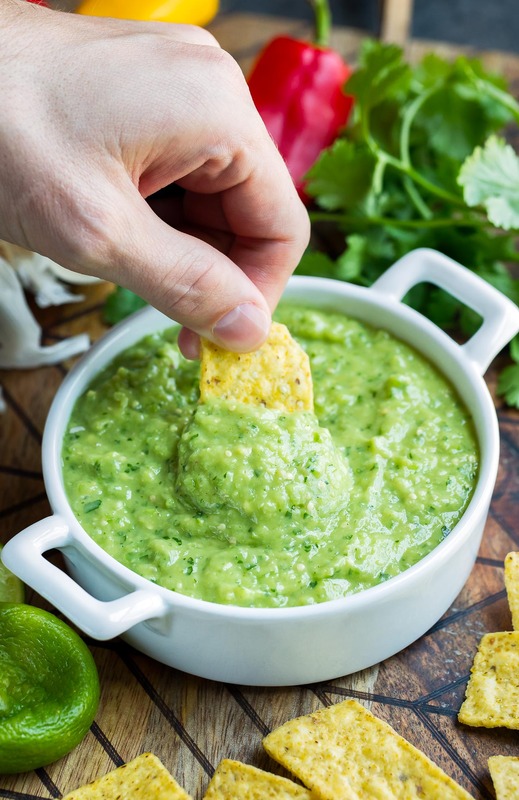 Ditch the jar and make this easy peasy tomatillo guacamole dip at home. This delish dip is living it’s best life. 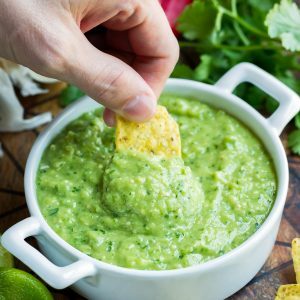 A hybird of our go-to recipes for guacamole and salsa verde, this avocado salsa verde is a tasty appetizer that’s healthy and full of flavor! It totally reminds me of the guacamole salsa from restaurants and my husband and I adore it! Because we’re big fans of changing things up each time we make a recipe, I am happy to report that this dip can flex itself into so many tasty things! First off, if you’re craving a creamy, dairy-based avocado dip, you’re in luck! Adding sour cream or Greek yogurt to the blender has some pretty dreamy results. Love a dip that really packs some heat? ME TOO! Leave all the seeds and goodies in your jalapeño pepper (just remove the stem) when you add it to the food processor. You can also double up and use two, or grab a spicy Serrano pepper or two to do the trick. In a pinch (hah) a pinch or two of cayenne pepper will also amp things up for ya. Grab some crunchy tortilla chips to serve this up for some serious snacking or simply grab a spoon and get ready to drizzle this all over your entire Taco Tuesday spread. It’s great on everything from tacos to salads! This scrumptious salsa does it all! Serve it up as a dip as an appetizer or snack, drizzle it on taco salad as a creamy avocado dressing, or spoon it as a sauce onto tacos, tostadas, or even fajitas and get ready to rock taco night like never before. Remove husk from tomatillos, rinse, pat dry, and coarsely chop. Remove the stem and seeds from your jalapeño, and chop. To control the heat of this dip, you can add as much or as little of the seeds as you want. This can be done at any time so feel free to taste the final product before spicing things up! 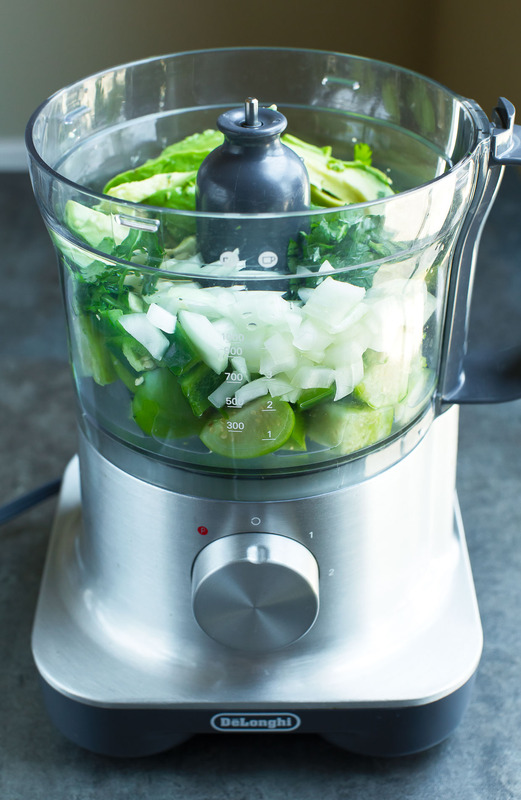 Add all the ingredients to your food processor or blender and puree until well blended. Dig in! Leftover dip may be kept tightly wrapped the fridge for a few days. To thin this dip into more of a salsa vibe, feel free to thin with 1/4 cup of water. Recipe yields 3 cups of dip. You have two tasty options here! Raw tomatillos are bit more acidic. Blending them with avocado in this speedy dip mellows the bite as the cilantro, garlic, and lime offer up an extra punch of flavor to this no-cook salsa. Roasting the tomatillos first lets more of their flavor and natural sweetness shine through. Both options are delicious so choose your favorite! To roast tomatillos for this salsa, preheat your oven to BROIL and remove the husk from the tomatillos. Wash and pat dry, then slice horizontally. Spritz or rub lightly with oil and roast cut-side down on a parchment/foil lined baking sheet for approx. 8 minutes. Flip the tomatillos and roast an additional 5-6 minutes. Allow to cool before blending. I had to include this because my poor husband spent what felt like half the day circling his way around the produce section searching for tomatillos. He sent me photos of coconuts, plantains, and green tomatoes because he had never in his life seen an actual tomatillo. This is the same man that eats salsa verde almost daily. DAILY, people! Bahaha! He finally found them near the jalapeños in the chilled section of our produce department. Some stores may also keep them in little baskets near the tomatoes. You want to look for little green tomato-like fruits that are wrapped in a thin green papery husk. 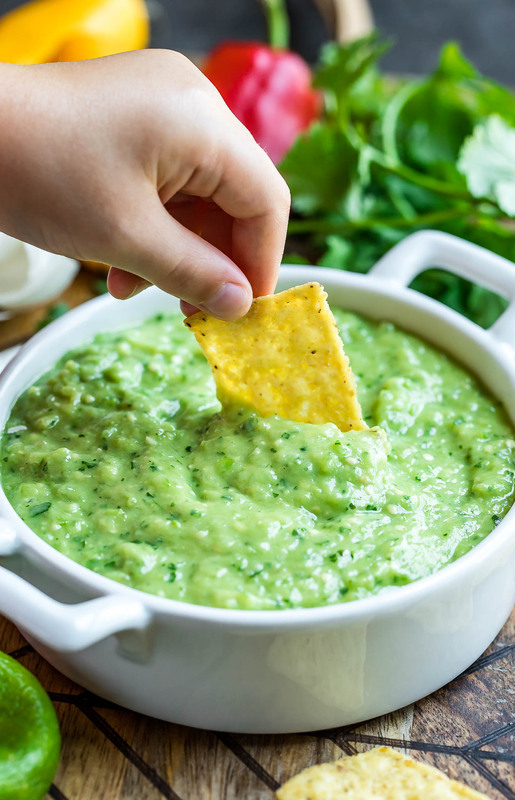 This avocado salsa verde dip is naturally vegan, vegetarian, gluten-free, grain-free, dairy-free, low-carb, keto, and paleo. It’s also Whole30 compliant so feel free to dunk crispy roasted potatoes in it or serve it up with your next cauliflower rice taco bowl. As I mentioned before, you can use either jalapeño peppers or Serrano peppers here, and I’m pretty sure a little bit of green bell pepper could replace them as well if you prefer. Make this dip as mild or as spicy as your heart desires! If you get a chance to try this awesome avocado salsa verde, let me know! Leave some love in the comment form below or tag your photos with @peasandcrayons on Instagram so I can happy dance over your creation. I made this today and it was excellent. Thanks! Living in Germany it is almost impossible to get tomatillos. Can I use someting else as a substitude?? Do you think it could work without the raw onion? My husband can’t eat onions but it looks so ridiculously delicious!!! Yes totally! The onion flavor def adds a little something extra but you could flavor it more by adding extra of your favorites! More jalapeño, garlic, or cilantro, for instance! This looks so good! Avocados and Salsa Verde…yes please! I can’t wait to try your recipe. You had me at 10 minutes! This is the perfect dip for summer! Bring on summer! I was lucky enough to try the Avocado Salsa Verde Dip at the end of an incredibly humid day and it hit the spot! This recipe strikes a perfect balance between cilantro and lime. The dip was very light and refreshing. It will certainly be a welcomed addition to Taco Tuesday at our house!! Thank you, Jenn! <3! So super stoked you enjoyed it Jen, thank you!!! We just had some of the leftovers on top of a Mexican lasagna casserole and holy cow – IN LOVE! Shut the front door! Want!!! Girrrrrrl you need a big bowl of this salsa verde goodness! I’m OBSESSED!